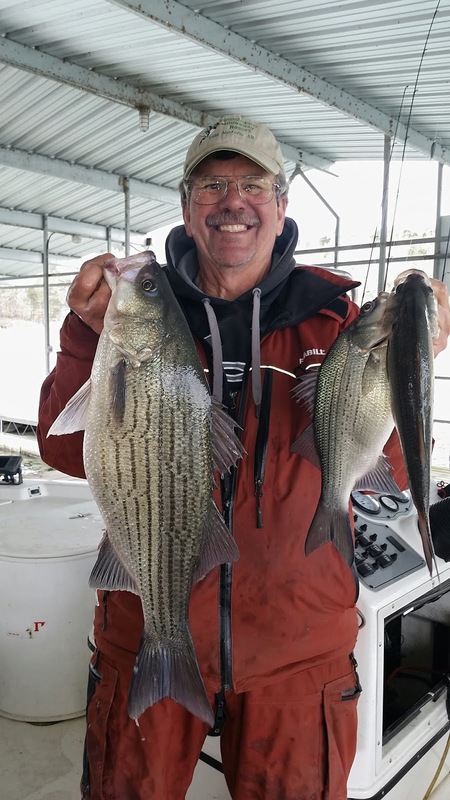 Norfork Lake fishing is starting to get exciting. 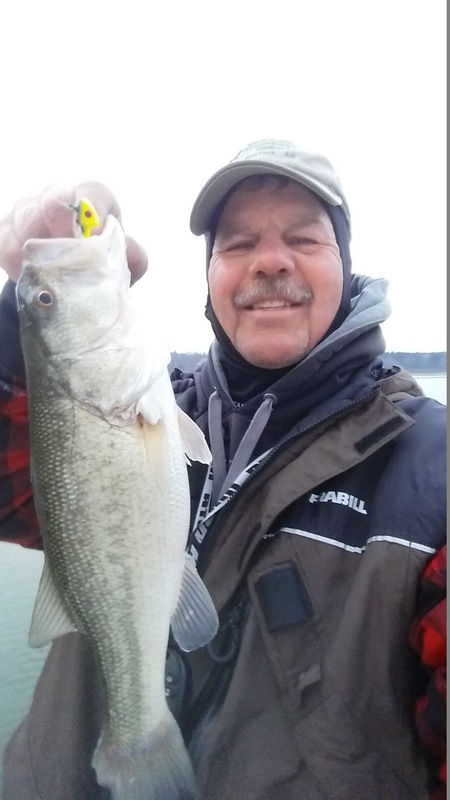 My guests and I have found topwater action for largemouth, white bass and striped/hybrid bass over the last couple of days. The lake temperature is rising and the fish are starting to get active and are starting to feed heavily. This is not say you can find the active fish everywhere, but you need to look around and when you find them, the fun begins! I have been doing a lot of searching on Norfork Lake waters from the mid lake major creeks up to the Bennett's area and also up river to Missouri waters. The best locations I have found are back in the bigger creeks and also in a few of the smaller creeks. I have also found the best bite is in the early morning until the sun gets above the tree line and then again in the late afternoon, starting around 4 PM until after dark. This is not to say you cannot catch fish during midday. The fish tend to move out of the shallow water into a little deeper water as the sun comes up. Yesterday was a great day for me. 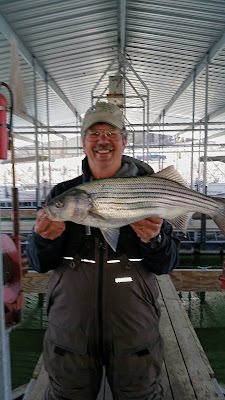 I fished both early morning and late afternoon to see if the night bite for striped bass was happening. I found striped bass, hybrid bass and white bass in shallow water early in the morning, as well as, at sundown. My best baits for striped bass have been a 6 inch swimbait with a 3/8 ounce jig head, a 1/2 ounce silver Kastmaster (blade bait) and then after dark a suspending jerkbait. At around 7PM I saw swirls of big fish right on the surface. 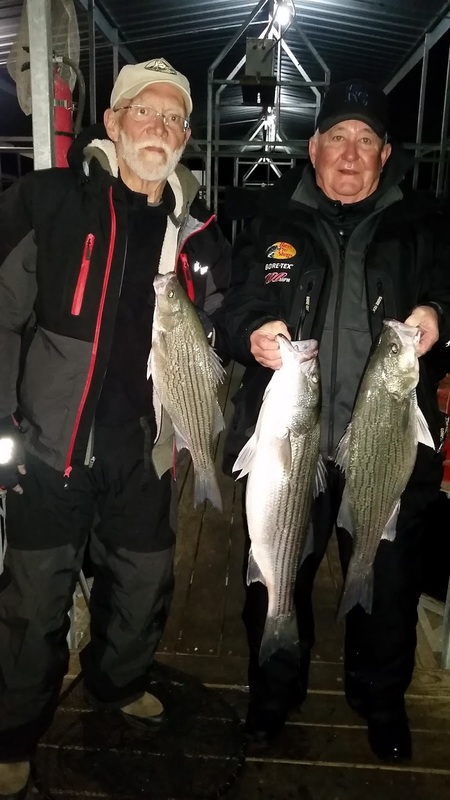 The stripers and hybrids were feeding. I landed the first hybrid on the swimbait. A lot of fish were farther from me so I switched to my Kastmaster since I can cast it farther. And the game was on after my bait switch. I would see a swirl, cast out my bait and after one little twitch of the rod tip, my rod would double over and the fight began. This action lasted until it became too dark to see. Once it was dark I switched to a suspending jerkbait. I found that a white or bone color jerkbait worked the best. I moved up closer to the shore line and slow rolled the bait back to the boat, occasionally letting it sit still. 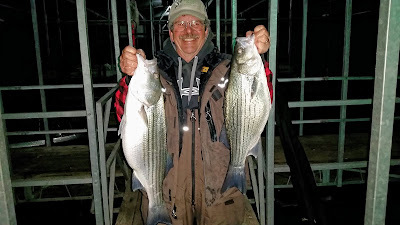 I ended up landing 9 stripers and hybrid bass with most coming from the topwater action, but the fish did move in tight to the shore after dark following the baitfish to continue feeding. I landed a nice fat 11 pound striper and a big hybrid after dark on a jerkbait. While I was into fish in one area, several of my guests got into topwater action along a deep bluff line about 2 miles away from where I was at. My guests were actually heading up to me when they found their topwater action. We all had a good time. The largemouth bass bite continues to be good. There has been good topwater action for this species early in the morning just as the sun is rising. The best locations have been towards the back of smaller creeks in shallow water, 5 to 20 feet deep. Just about anything you cast out will catch a fish when they begin feeding like this. My guests have gotten into this action for the last 2 mornings and have had a blast. Crank baits, Alabama rigs, topwater lures, jerkbaits and rattle traps have all been catching fish in deeper water and on the banks. My 6 inch swimbait is starting to catch some nice largemouth in the deeper water. You need to work the swimbait close to the bottom. If you don't find topwater, the fish will be up tight on the shallow banks out to 20 feet deep. 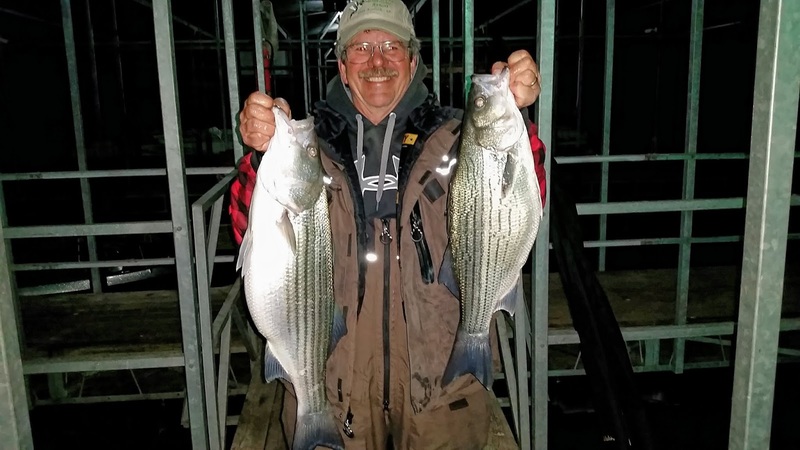 Last night when I moved from my first point after dark, I headed in towards a typical main lake point to see if striped bass were feeding along the bank. No stripers on these points, but I did find some really nice size largemouth right next to the sunken buckbrush. I was casting a suspending jerkbait working it very slowly. Norfork Lake has become fairly stable over the last several days with the lake only dropping about an inch a day. The current depth is 554.5. I really do like stable water for fishing. The surface water temperature is rising slowing and has reached the mid 50's. The main lake is clearing nicely and some of the creeks and coves are stained a great fishing color.